A Tonk's Tail... err, Tale...: Floral...Provenance? Allie: Back off, Maxie. 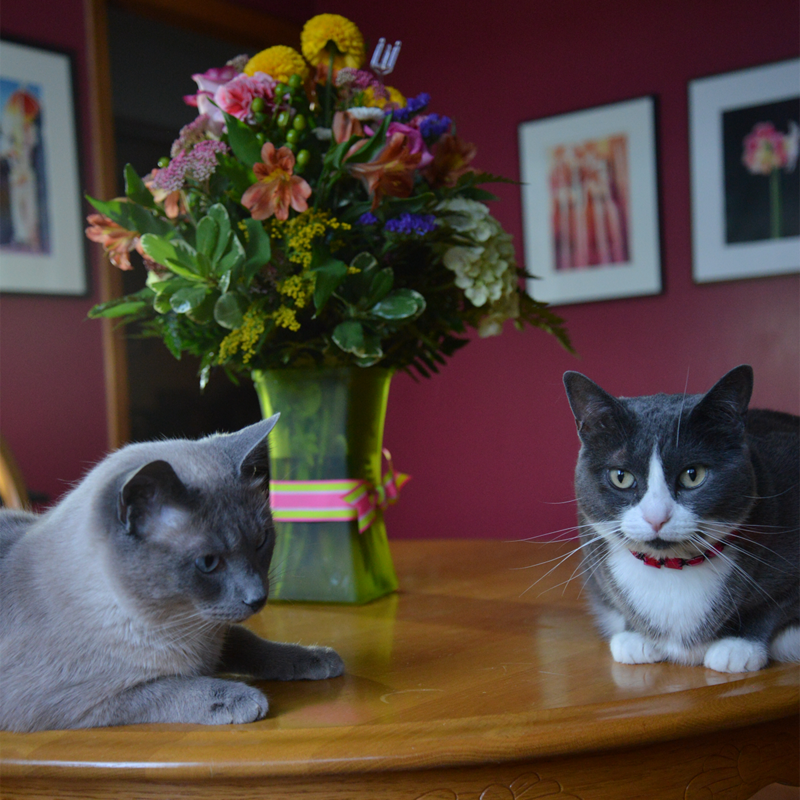 Those flowers are mine. Allie: Don't be silly Maxie. Of course my name was on it. Allie: Besides, who else would they be for? Faraday: They could be for me, you know. From my adoring fans. Allie: Oh Brat, honestly. The card quite clearly said they were for me. See? 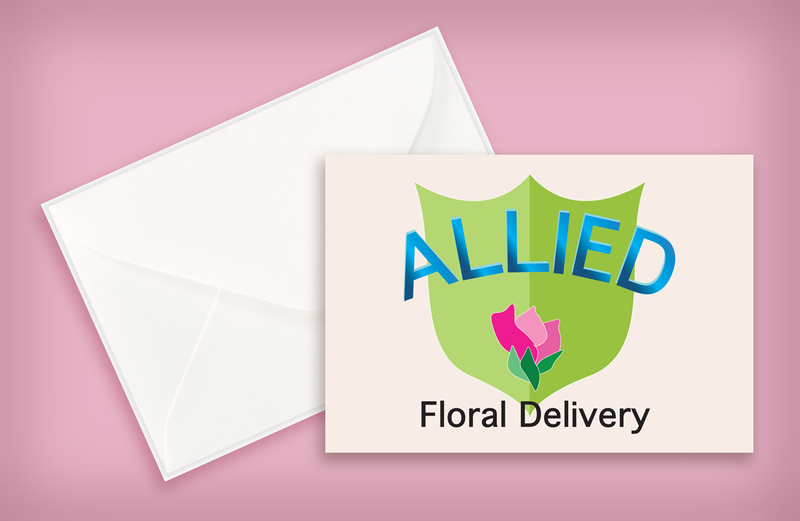 Maxwell: Allie, that says Allied Floral Delivery. Allie: Exactly! "Allie-D". Everyone knows Mother and Father call me "Allie Darling." So see? 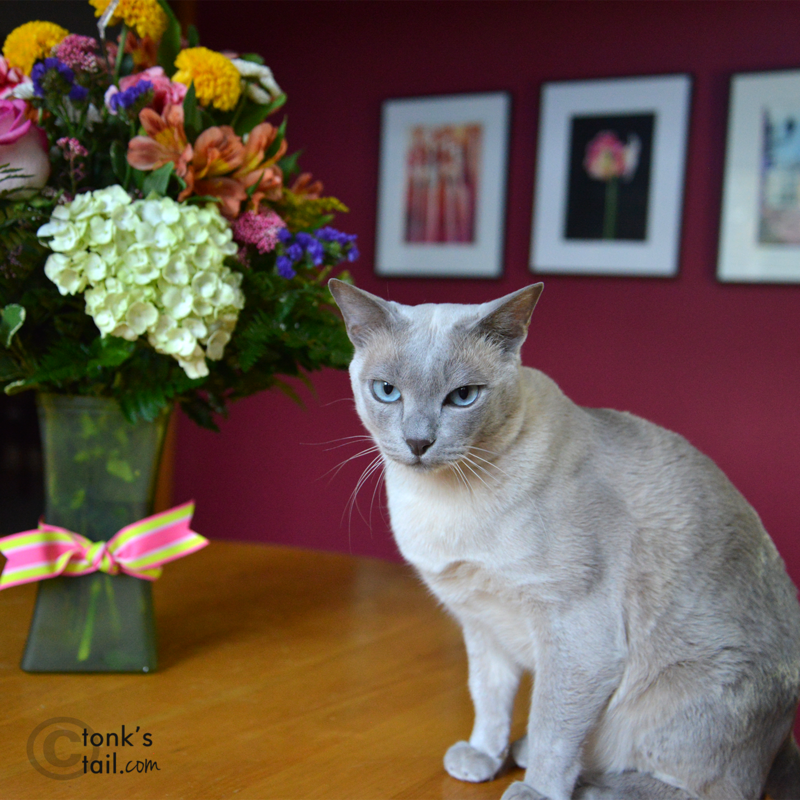 A "floral delivery for Allie D!" Faraday: *eyeroll* Seriouslies, Allie, that's about the lamest thing EVER. 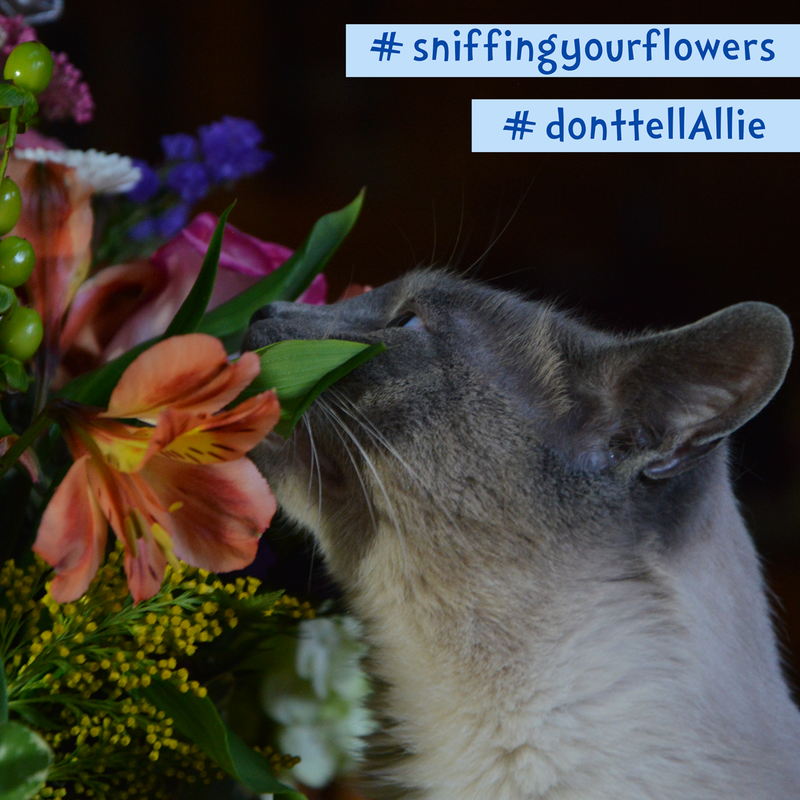 Uhm, Allie, I think these are for Momma. Maxwell: I hate to break it to you but...Allie... Momma's a girl, too. Happy Birthday to our Mom! 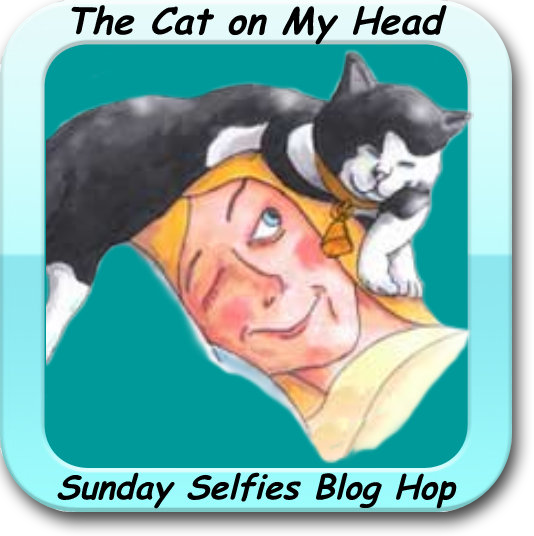 We're entering Maxie's sniffin' photo in the Sunday Selfies blog hop, hosted by the kitties over at The Cat on my Head. Happy Birthday, Lisa! Have a great day! Poor Allie, let down again. That is a lovely photo for your selfie Maxie. Beautiful flowers- Happy Birthday to your Mom!!!! 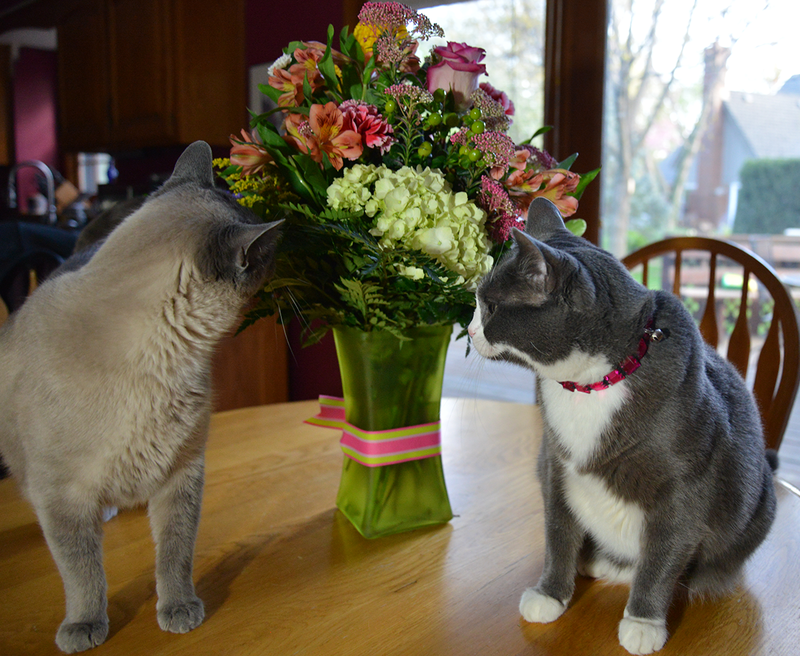 Those are lovely flowers for your beautiful mom! We hope she has a very Happy Birthday! Happy Birthday to your mom! I bet she will share them with you! Adorably cute post. Happy birthday to mom Lisa. Happy birthday to your mom! 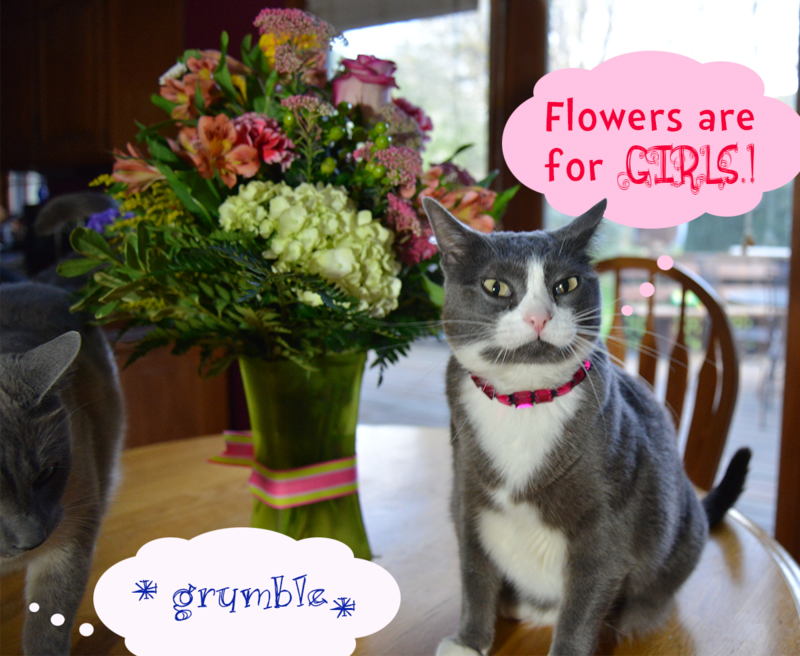 My cat bro Bert says you should eat the flowers, then they will be yours in the belly. Bert is a naughty cat, so follow his advice with care. A big happy birthday to your human! I'm so looking forward to meeting her at BlogPaws! * laughs tail off * Oh guys Allie makes me smile!. Happy Birthday mom Lisa - we hope your day is a good one with joy, laughter and fun. Poor Allie, what a shock! Happy birthday, Lisa!!! Happy Birthday to you Lisa!! 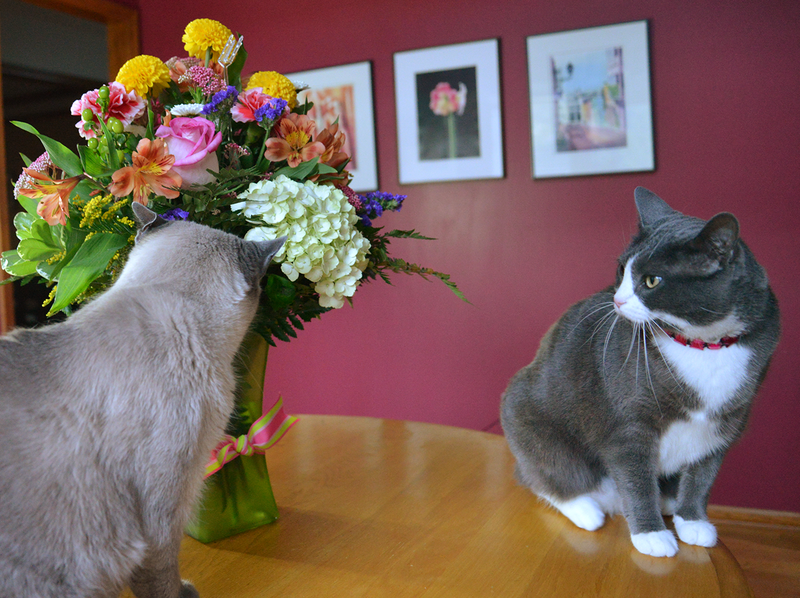 Your flowers look yummy!! Nothing more amusing than a confuzzled Mancat...getting his sniffing revenge on! Just sniff them, Faraday...don't eat them! Happy Birthday to your pawsome Mom! And mes hopes yous had the bestest one ever! Happy birthday to your awesome Mommy! Happy Bird-Day Ms Lisa!!!! Now who eggsactly found da plastic cardy ting and did yoo order lotsa tuna too? Yoor mommy must love tuna, it'd be wonderful prezzie even tho it banned for all of yoo. Happy Happy BIRTHDAY to your Mom !